The centuries old constructions around the world symbolize the architectural brilliance of our ancestors. The tools and different materials used for the construction of such wonders of ancient world completely beyond our imaginations. It is very hard to believe that the wonders like great wall of China,Colosseum of Rome, Great Pyramid of Giza and Taj Mahal were constructed at a time with no technology. Followings are 10 architectural wonders of ancient world. Pont Du Gard is a 50 kilometer long ancient Roman aqueduct bridge (waterhouses used by Romans) across Gardon river in Remoulins commune of Southern France. The bridge is a true masterpiece of ancient Roman architecture. 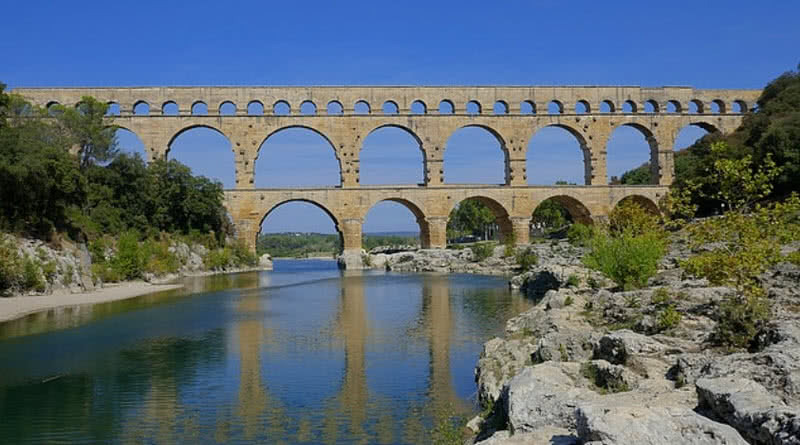 It was built in the half of first century A.D to transport water from Uzes commune to Roman province of Nimes. It is one of the best preserved monuments of ancient Roman architecture and a world heritage site in France. Pont Du Gard is a three storey aqueduct bridge standing 50 meter high and longest level measuring 275 meters in length.The number of arches and span changes from lower level to upper level. The bridge was constructed out of 50400 tons of limestone without using mortar. The blocks were precisely cut by the builders so that they fit closely together. Historians also found numbering on the blocks of bridge, used by builders for scaffolding. The walls of bridge also inscribed with messages and instructions by the builders. Today the bridge is a pride of France and globally popular for it’s historical importance. 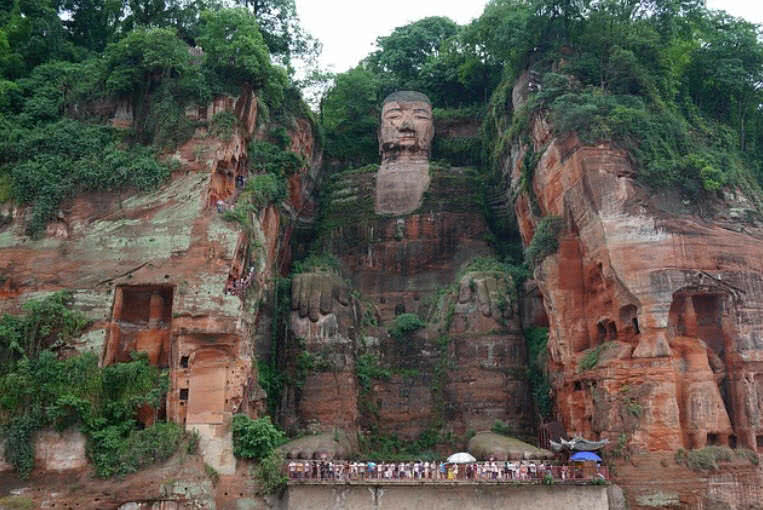 Leshan giant Buddha is the largest carved stone Buddha statue in the world. It is carved on cliff face of mountain in Sichuan province of China, site at which Minjiang, Dadu and Qingyi rivers meet. It is the most important attraction of Leshan city and faces sacred mount Emei. The 71 meter Buddha statue’s shoulder is 24 meter wide and has 27 feet fingers. The construction of the great Buddha statue started in 713 by Tang dynasty and took long 90 years for it’s completion. It was commissioned by a Chinese monk named Haitong. The monk hoped that lord Buddha would protect the site from turbulent water of confluence of three rivers. The head of the Buddha statue is decorated with 1021 buns. It is one of the most highlighting architectural feature of the statue. The hidden drainage system of the Leshan Buddha statue also represent the architectural brilliance of builders of that time. The hidden channels of drainage system go through head, cloths, arms and behind of ears of the statue. It plays an important role in keeping the Buddha statue from easy degradation. Saksaywaman is a walled Inca fortress located in Cusco city in Northern Peru. The complex is one of the most important archaeological site in the country. The large monumental complex is located at an attitude of 3701 meter and covers thousands of hectares of land. It is three level complex made of large stones. The size and shape of stones used for the construction also varies at different sections of the site and biggest stones weighs more than 200 tons. The large complex was built by Inca empire (between 1438 and 1533). 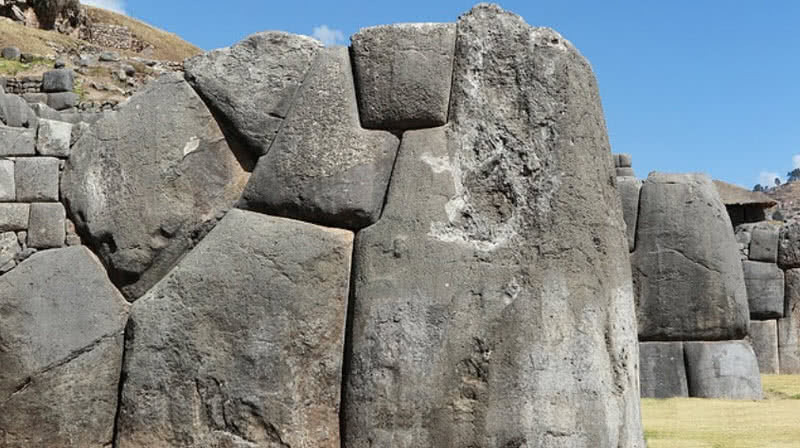 The Inca architects rough-cut the large stones and fit together perfectly without using the mortar.The large rocks were imported fro mile away places using only man power The method used by Incas for match the stones are still a mystery. They also used stones of variety of shapes for the construction of the complex. It helped many parts of Saksaywaman to remain intact. Borobudur is the largest Buddhist temple and a world heritage site situated in Central Java in Indonesia. The impressive archaeological marvel was built 400 years before the construction of great Angkor Wat (largest religious monument in the world ) in Cambodia. Borobudur is a three-tier temple that covers an area of 1900 square meters. The monument has a pyramidal base, a cone structure at the center and a stupa at the top level. The temple also houses 504 Buddha statues and 72 open work stupas. 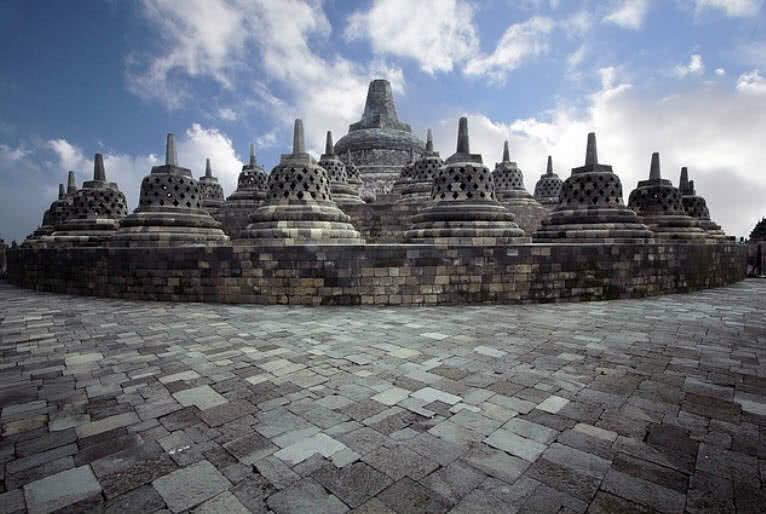 In 1991 UNESCO recognized Borobudur asa world heritage site. According to the inscriptions Borobudur temple was built between 8the and 9th centuries. But until now there is no data about the builders of the great architectural wonder. The temple remain hidden from the outer world for centuries and rediscovered back in 1814. Archaeologists estimated that 55000 cubic meters of andesite rocks for the construction of the temple. Knobs and woodworking joinery were used by the builders for joint together the massive stones. The three levels of the temple represent three main areas of Buddhist cosmology called kamadhatu, rupadhatu and arupadhatu. The Buddha statues found on different sections of temple also express six different types of mudras. There is also a giant puzzle made of two million volcanic stones. Another important architectural attraction of Borobudur temple is it’s water gutters. In fact the temple has 100 water gutters in total, made in the shape of elephant headed fish known as ‘makara’. Petra in Southern Jordan is one of the most famous archaeological site in the world. The rock-cut city was the capital city of ancient Nabataeans (between C.E 37-c.100). Petra is also known as ‘Rose city’ because of red-rose sandstone of mountain out of which the city was carved. The world ‘Petra’ means rock in Greek language. 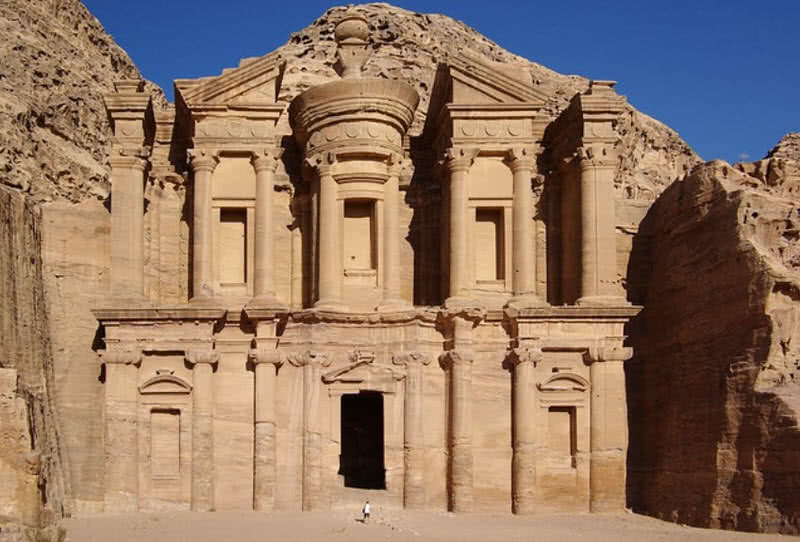 Petra is also a unique example of rock-cut architecture and it attract tourists from all over the world. Nabataeans built houses, temples, tombs and altars on sandstone cliffs of Petras 2000 years ago. The city served as a caravan for ancient traders who travelled between Mediterranean and Africa. Petra remained hidden from outer world until 1812 and rediscovered by Swiss explorer Johann Ludwig Burckhardt. There are 800 monument in Petra and most of them represent the fusion of Nabataeans rock-cut and Hellenistic architectural styles. The ‘king’ wall’ is one of focal section at Petra city. It contain three large royal tombs on the mountain face. All the tombs are highly decorated and have inscriptions. Khazneh el Faroun is another finest construction on the rock of the mountain. It is also known as ‘Treasury of Pharaoh’ which is adorned with great architectural elements such as sculptures and columns. There are also important relics from the Roman rule in the city. Taj Mahal is the most important historical monument and outstanding example of Mughal architecture in India. Taj Mahal means ‘Crown of palaces’ in Arabic language and it is also considered as most iconic symbol of love. The marvelous marble mausoleum was commissioned by Mughal emperor Shah Jahan. The monument represent the combination of Mughal,Ottoman Turkish, Persian, Islamic and Indian architectural styles. In 1983 UNESCO recognized Taj Mahal as a world heritage site under the criteria of masterpiece of human designs. The construction of Taj Mahal was started in 1632. It was designed by a group of three skilled architectures named Ustad Ahmad Lahauri, Makramat Khan and Abd ul-Karim Ma’mur Khan. Thousands of craftsmen, artists and painters employed for the construction. The domed mausoleum along with it’s huge garden was completed in 1953. Sandstones, white marbles, jasper and jades were mainly used for the construction of monument. 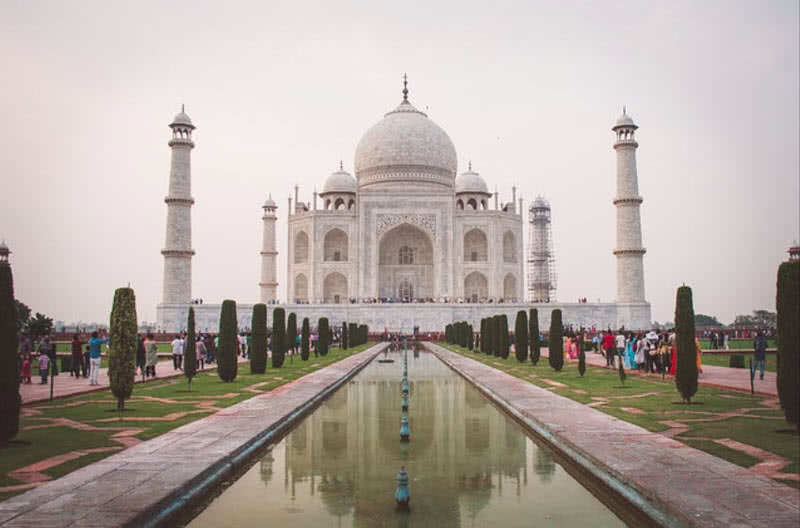 The white marble for Taj Mahal was imported from Makrana of Rajasthan. There are also 28 different types of precious and semi-precious stones were used for the decoration of the mausoleum. Many parts of the Taj Mahal were also inscribed with important verses from holy Quran. The paintings on the monument also represent different geometrical patterns. The 35 meter tall dome is the most attractive feature of Taj Mahal, built using traditional Persian and Hindustani architectural styles. There are also four impressive minarets at each corners topped by small domes and equally divided by balconies. The large garden of Taj Mahal symbolize the concept of ‘paradise garden’ describe in mystic Islamic texts. The garden is filled with many beautiful flowering plants, trees and birds. It is also divided in to four main parts by marble canals. 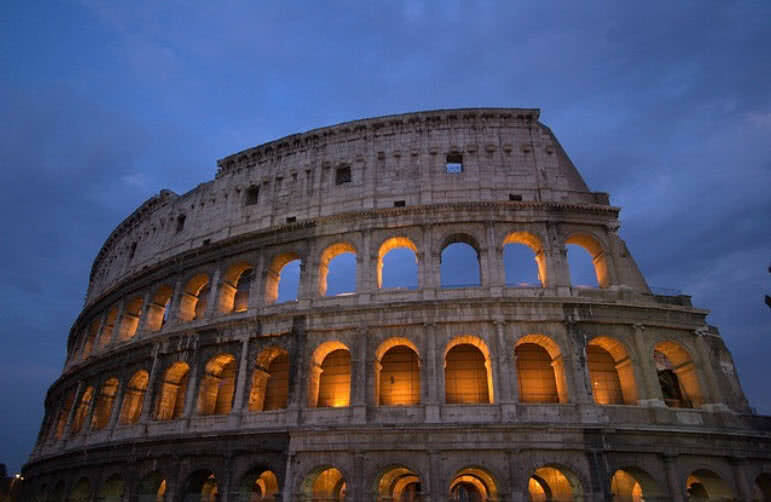 Colosseum is the most impressive monument of Roman empire and finest example of Roman architecture. It is also the largest amphitheatre in the world. It was commissioned by emperor Vespasian in A.D 70 and completed in A.D 80 by his son Titus. The building has an elliptical structure and standing at 159 feet. Once it was used for staging fight between gladiators and wild animals. The colosseum remained in active for four centuries and abandoned in 5th century. The monument was also heavily damaged by earthquakes of 847 AD and 1231 AD. Colosseum is originally built as a four storey building with 80 entrances and had capacity to hold 50000-80000 spectators. It was decorated with marbles and contain hundreds of life size statues. Each floor of the amphitheatre was dedicated for people of different classes, top floor for lower classes and lowest floor for important citizens.There are also an underground cage section for keeping the wild animals for the gladiatorial fights. Most of interior section of colosseum was made of wood. The builders were used tired arrangements for seating in the colosseum. They also built box type seats for Roman empires and other members of royal family. Today the surviving parts of colosseum contain wall at the Northern side of the monument. The underground passageways that once used for transporting wild animals also opened for public. Stonehenge is a massive prehistoric stone monument located in Salisbury city of England. It is a circle of standing stones of different size. 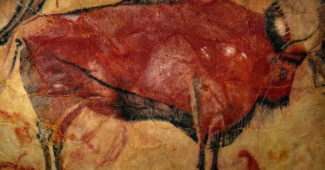 Archaeologists estimated that the monument was built before 4000-5000 years ago. Stonehenge also represent architectural brilliance of ancestor lived in the area at that time. There is no written record about people behind the construction of stonehenge and exact purpose of it. Ancestors mainly used two types of stones for the construction of stonehenge known as bluestones and sarsen stones. The bluestones weighs more than 25 tons and sarsen stones weighs up to 4 tons. All the massive stones for the construction of monuments imported from faraway places. But the method used by stonehenge builders for importing and placing the enormous stones still unclear. It took more than 1500 years for the construction of monument like stonehenge at that time. Stonehenge is also aligned with midwinter Sunset and midsummer Sunset. 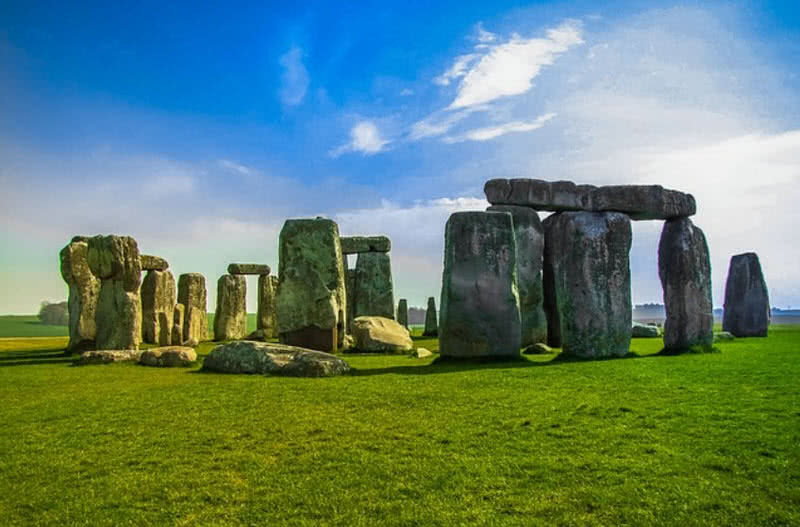 There are many speculation on the reason behind the construction of Stonehenge, ranges from burial site to religious site to astronomical observatory. Great pyramid of Giza is one of seven wonders of ancient world and also the largest pyramid in the world. It was built as a final resting place for Egyptian pharaoh Khufu. It is also considered as one of greatest achievement of ancient Egypt. Still there are only a few records about methods used by ancestors for quarrying, shaping, transporting and placing massive stone blocks for the constructions of great pyramid of Giza. The pyramid of Khufu was constructed between 2560 B.C and 2540 B.C. At initial height of 146.5 metres it remained as tallest building in the world for next 3800 years. Great pyramid of Giza is the only Egyptian pyramid to have both ascending and descending passageways. Archaeologists believed that ancient Egyptian architects were used the knowledge about alignment of stars for planning and designing of great pyramid of Giza. It is estimated that around 2.3 million stone blocks were used for it’s constructions. The stone blocks were transported from nearby quarries via Nile river. It is believed to be the builders used to cut the enormous stone blocks by hammering with wooden wedges. 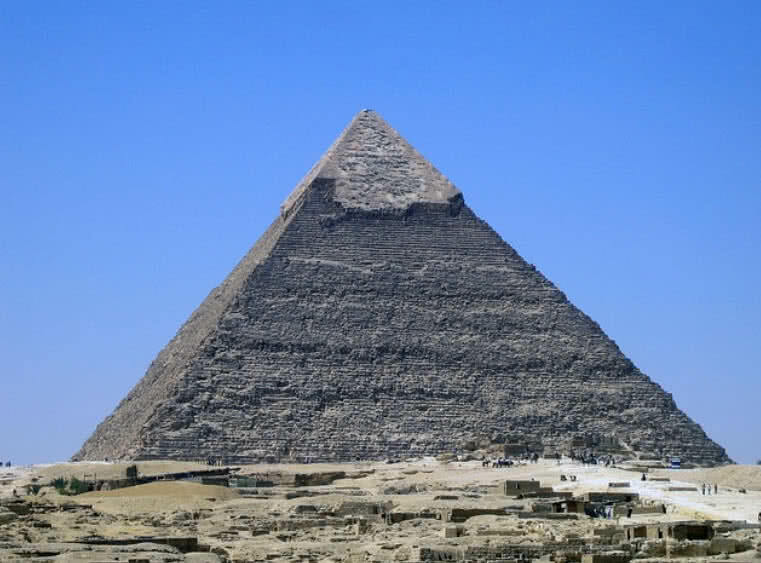 They also used 500000 tonnes of mortar for the construction of pyramid. It is impossible to reproduce such strong mortar today. The original entrance to the pyramid stands at metres high and the passageway from the door leads to lower level of the monument. Pyramid of Khufu has three burial chambers located at three different level of the pyramid. The pharaoh’s chamber is located at the center of the pyramid and it can be accessed by passageway called grand gallery. The chamber of queen and rock cut chamber can be found at lower level of the pyramid. The great monument also contain wooden statues, stone carvings and luxury items. The longest man made structure ever built on the face of the world. It is a non-continuous structure originally built by emperor Qin Shi Huang to defend attack from ancient Yayun tribe. It was completed by different dynasties in different period of time. Considering the architectural significance and historical importance UNESCO recognized the great wall of China as a world heritage site in 1987. 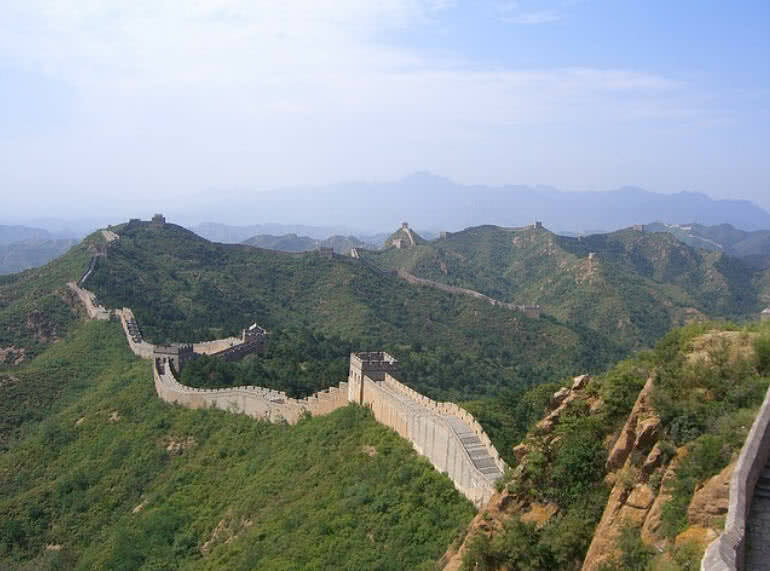 The great wall of China was originally built between 220 and 206 B.C. Bricks, stones, tamped Earth and woods were the main materials used for the construction of the wall. Only a few section of original wall remains today. Later Liano, Jin, Yuan and Ming dynasties added defensive walls between 10th – 14th centuries. Thousands of watch towers were also added to great wall by that time. Today great wall stretches over 50000 kilometers in length. The height of wall ranges from 16 to 33 feet and has an average width of 15 feet. Great wall lost military operations at present stage and attracts millions of tourists from around the world.